The Delongi Caffe Corsa ESAM2800 might not be the most advanced or feature-packed bean-to-cup coffee machine - but there's no doubt it brews excellent espresso. The steam wand is also great for frothy milk. The Delonghi Caffe Corso ESAM2800 is at the lower end of the price spectrum for bean-to-cup coffee machines – yet still aims to provide top-quality espresso. It features a two spout design, steam pipe for milk frothing and a several options for coffee customisation. Considering the relatively low price, it seems like a good buy – at least on paper. It’s also proven to be a popular model amongst coffee enthusiasts that don’t want to spend a fortune on a luxury machine. Does the machine live up to Delonghi’s claims though? And, most importantly, how does the espresso taste? Keep reading our full Delonghi ESAM2800 review to find out! With its simple silver design and basic control panel, the ESAM2800 is an attractive coffee machine that won’t look out of place in any kitchen. It comes in simple packaging, along with an instruction manual and some helpful guides. You also get a measuring spoon for ground coffee – although a milk jug isn’t included. The Caffe Corso has dimensions of 28.5 x 36 x 37.5 cm. It’s not huge, but it’s also not as compact as models such as the Melitta E953 (at least in terms of footprint). Make sure you measure the size of your kitchen counter to check it fits before you buy – unless you’re planning on keeping it in a cupboard when not in use. As you would expect from a Delonghi bean-to-cup coffee machine, the ESAM2800 “feels” like a quality machine. It’s always difficult to judge long-term durability, but it certainly doesn’t appear a machine that’s going to break down quickly. Delonghi also offers a standard 2-year warranty for extra peace of mind. Like all bean-to-cup coffee makers, it’s loud – especially when grinding the coffee. Even so, we think the ESAM2800 is particularly loud even for a bean-to-cup. This might be something to keep in mind if you plan on using it at night. When it comes to brewing coffee, the ESAM2800 has an instant water reheat function. This ensures that water is always the correct temperature for brewing a tasty cup. There’s also a steam wand, which can be tucked in when not in use. This does a great job of frothing milk for cappuccinos or lattes, and you can also use it for hot water, although it doesn’t come with an automatic milk function like the ECAM 23.460. Once the steam wand has been used, the machine won’t brew coffee until the internal temperature has dropped enough to avoid burning the coffee. The control panel is straightforward as there aren’t too many advanced features. There are two dials – one for water volume and the other for strength – along with an ECO button and cleaning mode. You can also select one or two cups using the top buttons, which is useful if you want to relax with a friend or partner. We like that the water tank, which is found on the side of the machine, can be removed via the front of the ESAM2800. This means you can refill it without moving the entire machine – which is especially important if you want to keep it on display. The ESAM2800 uses a 15-bar pump, which is standard for a machine of this type. It’s a true bean-to-cup machine, as it grinds new beans every time you brew. Beans are ground in the conical burr grinder. This has 7 settings for coarseness, allowing you to fine-tune the taste. The machine does a great job of grinding beans consistently and into a compressed plug-shape. Aside from the grinder, there are several other options. You can adjust the amount of water used via the first dial, depending on the type of coffee you want to brew. The second dial controls how much coffee is used, so you can use this to adjust strength. It’s not immediately clear how much coffee or water each setting corresponds to, however, so you’ll probably need to try a few options before settling on your ideal espresso. A bonus is that the machine has a feature for adding a small amount of extra water once the brew cycle is complete. You can use this to top up your cup as required. Unfortunately, there isn’t an option to adjust the temperature of the water. You can change the temperature of the steam output though. Making an espresso takes around 40 seconds with the De’longhi ESAM2800, so it’s not the fastest machine. Fortunately, the coffee is definitely worth the wait! The Delonghi Caffe Corso makes fantastic espresso from fresh beans. It has a rich taste and aroma, along with an attractive golden crema. Considering this is one of the cheaper bean-to-cup machines, we’re impressed by the quality. You can also make coffee with ground coffee – and the results are just as good. There’s no function for automatically making milky coffees such as cappuccinos or lattes. You can, however, use the milk frothing arm to make this manually. Like all manual milk arms, it’ll take some practice to get it right. The good news is that the ESAM2800 is capable of making excellent frothy milk that’s at just the right temperature. The options for water and coffee quantity, along with the steam wand, mean you can make a variety of drinks. These include Lungo, Latte, Long Blacks and Americano. Whatever you decide to make, the machine produces consistently tasty coffee. The first thing to note is that you need to invest time in keeping a bean-to-cup coffee machine clean. This means regularly descaling it, maintaining the brewing unit and generally making sure everything is running smoothly. While this can be annoying, the upside is bean-to-cup coffee machines are usually much less hassle to make coffee with. Like many bean-to-cup coffee machines, the ESAM 2800 comes with de-calclification and rinse cycles. The descaling mode is important for any machine, but especially as this one doesn’t come with a water filter (click here for more information about water consumption). Delonghi also provide a descaler kit, although you’ll need to buy new ones as required. You can also open the front of the machine and completely remove the brewing unit for more thorough cleaning. It’s great that Delonghi have put thought into making fiddly places to clean more accessible, as this makes the ESAM2800.SB easier to maintain. A handy feature is that the grind pot is located in the drip tray. As this is the part of the machine you’ll be cleaning most often, this configuration saves some time. One thing to note is that the machine automatically completes a rinse cycle whenever it switches on or off. This is great for maintaining the interior of the machine and making consistently tasty coffee, but adds to the total time required. The ESAM2800 has an Eco Mode for when you want to save energy. This can be activated using a button on the front of the machine. The water tank is 1.8L in size, so you won’t need to continuously refill it. We think the De’longhi Caffe Corso ESAM2800 provides excellent value for money. It’s considerably cheaper than many other bean-to-cup coffee machines, but still produces outstanding coffee from both beans and ground coffee. It doesn’t come with many advanced features – and you might want to look at the Eletta ECAM44.660.B if you want automatic cappuccino – but for most coffee drinkers the ESAM2800 is a great choice. The ESAM 4200 is a similar model that’s also worth considering. 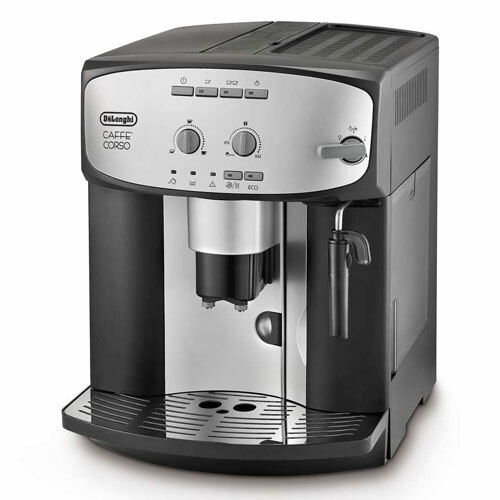 The Delonghi Caffe Corso ESAM2800 bean-to-cup coffee machine is one of our favourite lower-priced options. It’s not “cheap,” but it costs less than many others yet still makes a fantastic cup of espresso. We highly recommend it. Sage Duo Temp Pro Review – Is It Worth The Money? © BeanToCupCoffee.co.uk 2019. All rights reserved.